WiredState Audio Community • View topic - FAKE TUBES ALERT! There are fake or rebranded NOS tubes out there! I recently came across a "NOS Mullard 6SN7" in Mullard boxes with white printing of Mullard on the glass. "Made in USA"! Mullards are made in the UK, not USA! These are actually Russian 6SN7s. If you want them, you may pay pesos 500/pair. Thanks VD. I heard there are a lot reproduced Mullards branded tubes in the market nowadays. I think i saw one in a store. Medyo hawsyaw nga printing. Thanks. thanks for the heads up VD. Thanks for your concern to your fellow audiophile. yes. i heard too that there are fake Telefunkens that have the engraved diamond at the bottom. these usually have very 'fresh' paint markings, and it pays to know how non-fake Tele markings look like. for mullards and amperex tubes, i look for the acid etched markings near the bottom of the tube. amperex has a 'delta' mark before some numbers, and mullards have two rows of letters and number codes. asterix instead of delta on amperex means they are US made as opposed to Holland made, both authentic. Last edited by jadis on Wed Dec 07, 2005 8:57 pm, edited 1 time in total. HAVE COME ACROSS A US MADE MULLARD 6SN7 MYSELF. Yep! Because Mullard never made a 6SN7, ever! I know the fellow who are are referring to. A lot of people and HK friends have warned me as well about him. Hope no one has bad experiences here w/ him. The Tele CCA's that I bought from him years ago were definitely NNS ( New New Stock) Hahahaha Oh well, you win some and you lose some. 1. really don't know they are fakes. 3. in the business of making fake tubes for profits. madami ito a HK. am not aware of any locally. Re HK fake tube sellers, Ken Chan of Sound Chamber told me he never and will never buy tubes from any HK dealer. This, despite the fact that he speaks Cantonese and is a native of HK! He sources the expensive ones from European dealers and the cheaper ones on ebay. 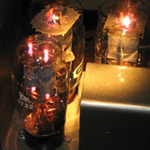 Tube buyers really need to be aware of their tube needs and research on how to detect fake from real tubes. Imagine the feeling of 'wearing' them all fake tubes and being happy about the sound of your tube gear WITHOUT knowing they are fake! The blast comes in when someone will identify it as a fake, and you suddenly feel pain in your stomach. Just this morning, a tube lover but not an 'aware' buyer showed me 6 used Telefunken tubes and asked me to test it on a tube tester. Lo and behold, one had 4 ridges typical of Amperex and Mullards on the top area, and even has a <> at the bottom. All others have no ridge on the crown. 2 other tubes measure weak, and the others good. This would be the first <> I have seen with diamond and ridge marks. I really don't know what to make of it. But I wouldn't buy it when I see one. Here are the Mullard EL34 repros. Sensor - makers of EH, Sovetk etc. It seems that New Sensor has aquired some of the rights to the "Mullard" brand. i certainly agree with one of the writers to this posts, after being burned by WIWI i learned my lesson, also i tend not to buy the super expensive tubes in hong kong with an the exception to the following: less expensive mullards and 300B's as these are made in china anyway. so no point buying TJ or Shuguang 300B in the US. in hong kong i find Brian Cherry of DIY in Mongkok to be reliable and honest, his TJ's are sold with the "birth papers" and matched with the SOPHIA. occasionally i got to Mr. Wong at Choice Audio for an odd piece. but mostof my collections were bought directly from my two sources in the UK and i basically go to thier shops and pick the tubes myself. Audiogeek wrote: Thanks VD. I heard there are a lot reproduced Mullards branded tubes in the market nowadays. I think i saw one in a store. Medyo hawsyaw nga printing. Thanks. Wiwi begone! the normal reaction for us in hk whenever we been had is to utter: "di** n* Lo M*!